This project took place in a building contaminated by asbestos and vermiculite but which remained occupied by its tenants during all the works. 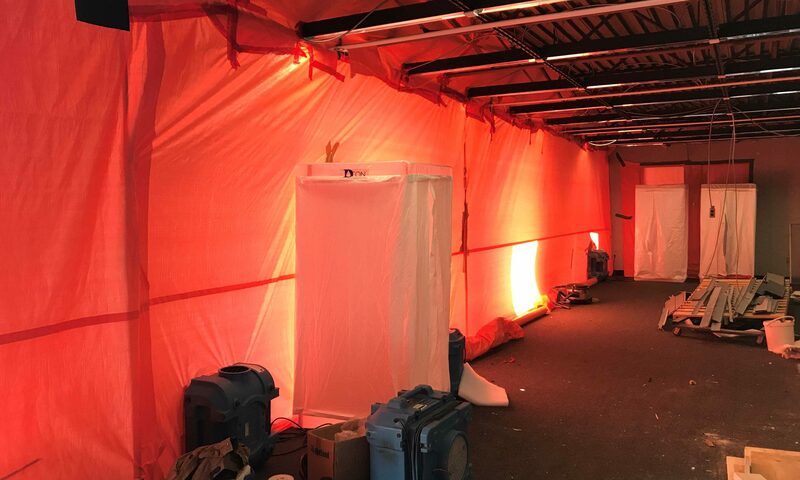 It was therefore necessary to proceed with the decontamination while keeping the spaces contaminated with negative pressure during the work. Subsequently, the common corridors were connected together by re-configuring the party walls and tenant divisions into a single corridor along the entire width of the building. The new corridor was subsequently completely renovated: new carpet, new architectural detail for ceilings and new suspended and wall luminaries. In addition, we have created a new shared toilet that can accommodate thirty employees working upstairs. Finally, the roof of over 30,000 square feet has been completely redone. On this roof was a 30-foot-high Bell Mobility antenna that was held in place by steel cables anchored to the structure and through which the rainwater infiltrated. It was necessary to coordinate with Bell Mobility to dismantle this structure to allow the execution of our work.